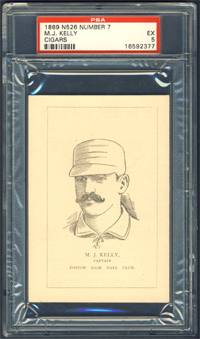 Baseball's first celebrity, Kelly was the subject of the popular song, "Slide, Kelly, Slide", recited "Casey At The Bat" on stage; and off the field played a role on dandy to a tee. On the field, her perfected the hit-and-run and developed the hook and head-first slides. He hit .308 lifetime and scored 1,357 runs. 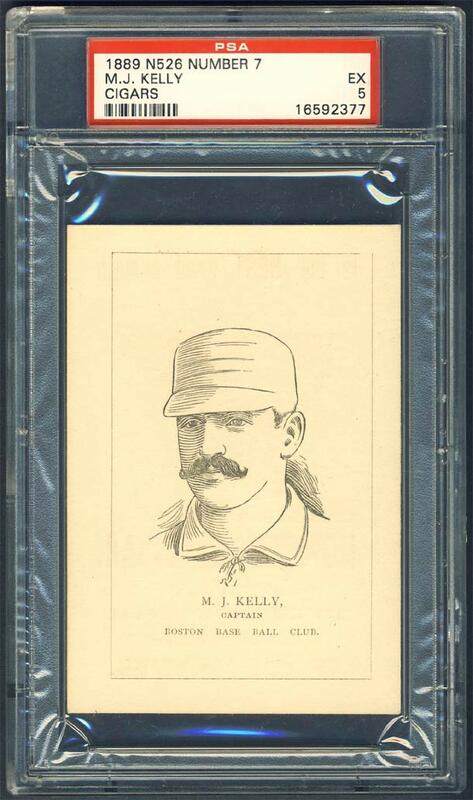 Comments: My first King Kelly was a 1950 Callahan tribute card - a PSA 7 example purchased in April, 2003. I upgraded to a PSA 8 in August, 2004 with an eBay win. Then, in May, 2005 I decided to go with something contemporary to his career and purchased a beautiful 1887 N28 Allen & Ginter PSA 5 from a friend in the hobby, Brian Hodes, via Net54 (also got a T206 Chesbro PSA 5 in the same transaction). I kept this card for a few years until I decided to buy a Comiskey N28 and go with a different issue for Kelly. 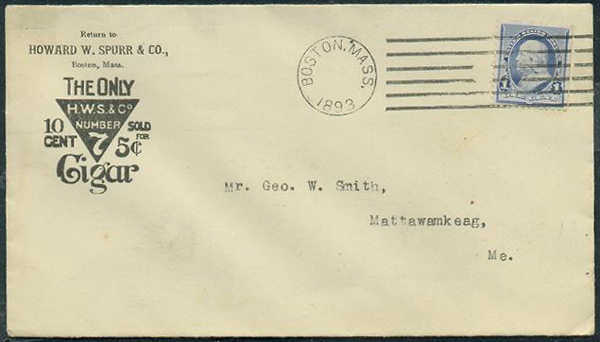 I purchased an 1889 N526 Number 7 Cigars SGC 40 from another friend - Jeff Prizner in October, 2008. In September, 2010 I ended up working out a trade with another collector (Lyle Jobe) where I sent him the SGC 40 card and cash for this beautiful PSA 5. 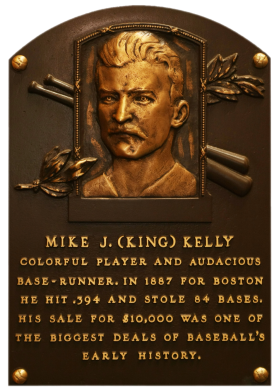 Description: Three versions of this set picturing Boston Beaneaters (N.L.) players were issued in 1889. 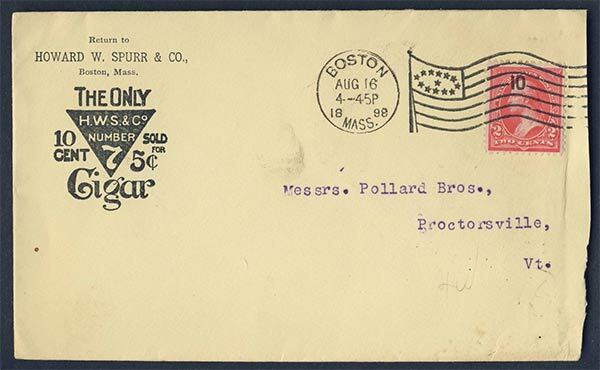 Number 7 and Diamond S brand cigars are the most commonly encountered advertising printed on the cards' backs. Cards with the "C.S. White & Co." at top front are also known. The cards measure approximately 3-1/8" X 4-1/2" and feature black-and-white portrait drawings of the players with their name printed below in capital letters along with the team name. 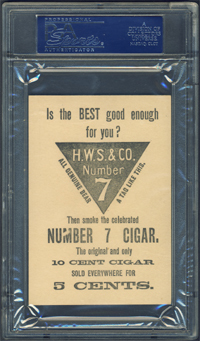 Backs carry ads for either Number 7 Cigars, a product of H.W.S. 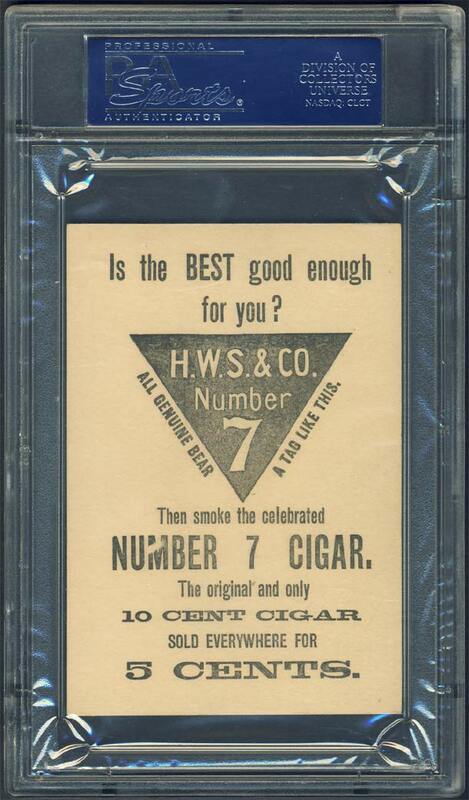 (Howard W. Spurr) & Co., or Diamond S Cigars, advertised as the "Best 10 cent Cigar in America."